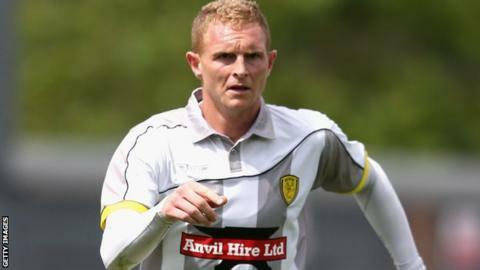 Burton Albion beat 10-man Scunthorpe to register a win in the first League One game in the club's history. Stuart Beavon's second-half strike gave Jimmy Floyd Hasselbaink's side the lead as he reacted quickest to a loose ball. The Iron then had goalkeeper Luke Daniels sent off after he appeared to strike Mark Duffy, with Lucas Akins converting the resulting penalty. Substitute Charlie Goode headed an injury-time consolation goal for the visitors from Gary McSheffrey's corner. "Scunthorpe are a good side. It was always going to be an afternoon where you have to defend well and at times we did. "I must say in the first half we had the two best chances. They had some chances - they hit the woodwork, but that's just what it is. "We looked good at times and at the end I think we looked the stronger team. In the last five minutes I thought we had another gear." "First and foremost we came here against a strong, physical Burton Albion side with momentum. "We've come off the back of a really good pre-season and you'd expect better from us. "I expect better from us, the players expect better from each other and we took a little bit of time to get some confidence." Match ends, Burton Albion 2, Scunthorpe United 1. Second Half ends, Burton Albion 2, Scunthorpe United 1. Attempt saved. Lucas Akins (Burton Albion) left footed shot from outside the box is saved in the top centre of the goal. Goal! Burton Albion 2, Scunthorpe United 1. Charlie Goode (Scunthorpe United) header from very close range to the bottom right corner. Assisted by Gary McSheffrey with a cross following a corner. Corner, Scunthorpe United. Conceded by Philip Edwards. Attempt saved. Jerome Binnom-Williams (Burton Albion) left footed shot from the centre of the box is saved in the centre of the goal. Corner, Burton Albion. Conceded by Jack King. Substitution, Burton Albion. Matthew Palmer replaces Mark Duffy. Jordan Clarke (Scunthorpe United) is shown the yellow card for a bad foul. Jack King (Scunthorpe United) wins a free kick on the right wing. Corner, Burton Albion. Conceded by Jordan Clarke. Substitution, Burton Albion. Jerome Binnom-Williams replaces Abdenasser El Khayati. Goal! Burton Albion 2, Scunthorpe United 0. Lucas Akins (Burton Albion) converts the penalty with a right footed shot to the bottom left corner. Substitution, Scunthorpe United. Joe Anyon replaces Tom Hopper. Penalty Burton Albion. Mark Duffy draws a foul in the penalty area. Luke Daniels (Scunthorpe United) is shown the red card for violent conduct. Penalty conceded by Luke Daniels (Scunthorpe United) after a foul in the penalty area. Attempt saved. Stuart Beavon (Burton Albion) left footed shot from outside the box is saved in the centre of the goal. Attempt saved. Mark Duffy (Burton Albion) right footed shot from a difficult angle on the left is saved in the bottom left corner. Goal! Burton Albion 1, Scunthorpe United 0. Stuart Beavon (Burton Albion) left footed shot from the centre of the box to the centre of the goal.